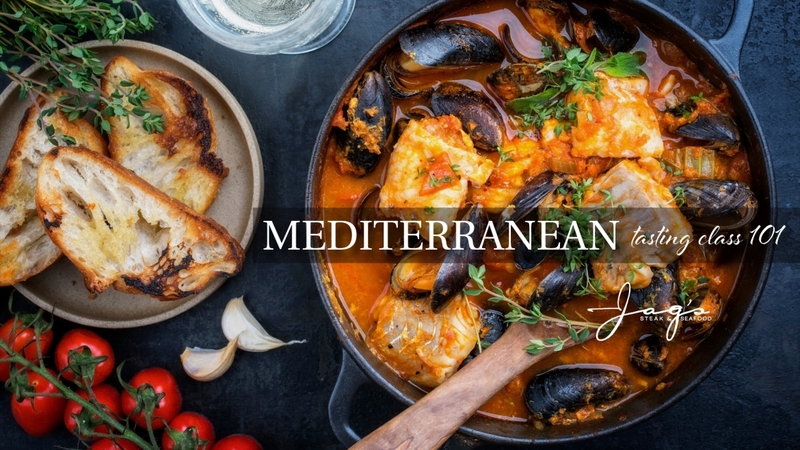 Immerse yourself into one of the world's richest cultures and explore a variety of Mediterranean dishes at Jag's next Tasting Class 101 — Mediterranean. Reserve your seat. Chef Michelle's team is already preparing each of the carefully crafted dishes and wine pairings that will be featured during the evening's service. The three core elements of Mediterranean cuisine - olive, wheat, and grape - will be on full display with other regional delicacies like lamb, couscous, and mussels. The Tasting 101 will take place Thursday, March 28, beginning at 6:30 p.m., when you will be served each course from the following menu. After reserving your all-inclusive seat, all you need to prepare is your appetite for five-courses paired with a mix of craft cocktails wine and your Mediterranean spirit of sharing to enjoy conversations with the culinary experts who prepared the courses and other diners.